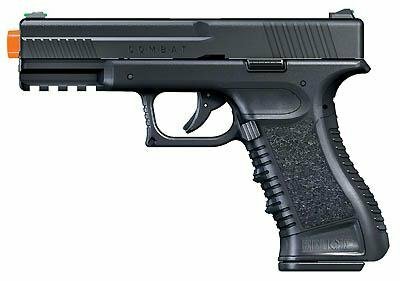 The Umarex Tactical Force Combat is a GBB (Gas Blow-Back) airsoft pistol. It’s mostly made of metal, with the exception of the grip, and in many ways resembles a Glock. It requires standard 12 gram CO2 cartridges to operate. The Tactical Force Combat is a GBB (Gas Blow-Back), as mentioned before, meaning that the slide jolts backwards every time you pull the trigger, just like a real gun. However, the Combat’s slide only blows-back about 3/4 of an inch, making it look and feel less realistic. It’s also a little clunky, meaning that the slide doesn’t blow back in a single, smooth motion; it’s almost feels like the slide is shuttering back and forth. This not only makes the gun feel sluggish, it makes more difficult to keep your sights on target when you’re shooting. GBB’s are known for their ability to “shoot as fast as you can pull the trigger”, but the Tactical Force Combat can easily malfunction when being shot too fast. Often times it will dry fire and then fire two BBs on your next shot if you shoot too rapidly. This isn’t a huge deal, it just forces you to slow down and take your time, which is usually a good thing anyway. However, it’s still a hassle for the times that it’s necessary to put BBs down range at a fast pace. The Combat also isn’t one of the more accurate pistols out there. At 15-20ft with .20 gram BBs it can hit a 12-inch Gel Trap with decent consistency. However, at ranges over 25 feet, the BB starts to sink and is very inaccurate. The sights are both good and bad. The front sight consists of a little white rod stuck through a standard black blade front sight, giving you a sort of white-dot sight. The back sights are made of a little bent green rod that is also stuck through a standard back sight, giving you a sort of green-dot sight. The contrast of green on white dots makes aiming and acquiring targets easy and fast. However, if you looked at the sights from the side, the green and white rods stick all the way through the standard sights, popping out the other side, making them look sloppy. But this is only a cosmetic issue, and doesn’t effect performance. The Combat boosts a impressive 400FPS (Feet Per Second) with .12 gram BBs, and averages between 350 and 380FPS with .20 gram BBs, depending on how new the CO2 cartridge is. Although .12 gram BBs have higher velocity, I’d recommend only using .20 gram BBs because they’re much more accurate. Through all the downsides, the Combat gets extremely good shots-per-CO2. The blow-back starts wearing down after about 8-10 magazines and the slide stops being blown back far enough for the slide lock to catch, but it still shoots BBs consistently up until 14-16 magazines. This is great if you’re planning on using it in a airsoft war, minimizing downtime. To put the CO2 cartridge into the gun you simply press a button on the bottom of the gun, directly behind the magazine, which releases the part of the grip, revealing a small compartment. From there, you fit the cartridge into the compartment and screw it in. The magazine is just like any other GBB magazine. There’s a little metal lever on the side of the magazine that you pull down to the bottom and lock in place. Once locked in place, you pour BBs into a small hole near the bottom of the magazine and then unlock the metal piece, putting tension on the BBs. The magazine holds 15 rounds and is full metal, making it both durable and relatively high-capacity. One of the more notable issues it the safety. Instead of simply sliding the switch back and forth, in order switch between “fire” and “safe” you must push the switch inwards and then back/forward. It’s very difficult to do this with one finger, forcing you to hold the gun in one hand while trying to manipulate the safety with the other. However, after switching between fire and safe multiple times, it starts to loosen up. The last thing worth noting is some of the little details. On the trigger itself there’s a mock safety, it looks like a smaller trigger coming out of the normal trigger, which on a real gun you press down along with the trigger to fire; although it doesn’t do anything on this gun, and is just for show. Another cool feature is the slide lock. As soon as you’ve discharged the last round, the slide stays back, indicating you’ve run out of ammo. In a wrap, the Tactical Force Combat pistol has a lot of issues, but also has potential. It’s great for CQB, but fails to stay consistent at long ranges. It also has a large magazine, and features very good shots-per-cartridge. The blow-back is a neat feature, but ultimately reduces accuracy. It’s really not a bad gun, but just not one of the best. New to airsoft? Take my Crash Course! Thinking about taking up airsofting? Read my "Getting Started" page! Do you have a airsoft related product that you want reviewed by me? Check out "How to Get Reviewed"!